Buy it at your local bookshop! In 2010, Lucy and her long-term boyfriend John broke up. Three long, lonely years later, John returned to New York, walked into Lucy's apartment, and proposed. This is not that story. It is the story of what came after: The Wedding. 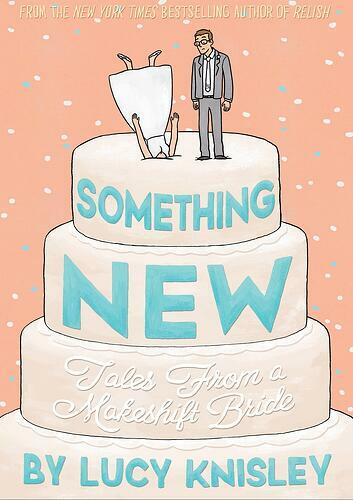 SOMETHING NEW, Lucy Knisley's autobiographical graphic novel about her wedding, hits that indefinable spot somewhere between memoir and how-to. If you've read RELISH or any of her travelogues, you'll know what to expect from this one: humor, lots of internal dialogue, and a level of detail that makes you feel like you just might be Lucy's friend. After the engagement, Lucy employs self-deprecating humor and pointed social commentary as she guides readers through the long and tedious process of planning "the event of a lifetime." An entire chapter is devoted to finding "the dress," an experience that is supposed to be fun, but usually causes undue amounts of stress. Chapters on food, money, pre-wedding parties, and "emotional sickness," cover most of the wedding bases, though the book clearly can't be a "how-to" because every couple, every venue, every family is different. For example, Knisley married at her mother's rural home, but that's not an option or a preference for many couples. The end result is a book that's part critique of the wedding industry and societal expectations, part tribute to the love and support she received throughout the process, and part funny retelling of all the things not to do.